AUTEUR ARIEL: Oh hey there, Braid! I chopped my hair about six months ago and although I loooooved the change, I was pretty bummed that I couldn't really braid my hair anymore. I mean, I could technically braid it, but there would be chunks of hair sticking out everywhere and it was just not a good look. As the months flew by and my hair grew out (my mane apparently has magical growing powers, btw), I kind of forgot about my braiding woes till the other day when I took these pictures. I wanted a different hairstyle than just down or up so I thought heyyyy, why not try out a braid? To my sweet surprise, a decent braid appeared! It was a pretty special moment for me because I hadn't had a braid in my hair for what seemed like a loooong time so it was like seeing a long lost friend again. Also, I just realized you read an entire paragraph about a braid in my hair. On a more relative note, I'm obsessed with this Knit Top and Print Scarf from Pink Blush that I'm wearing today! I love how the top has that open knit sweater look for Fall, but it's short-sleeved so you can wear it on those days that are a little warmer. 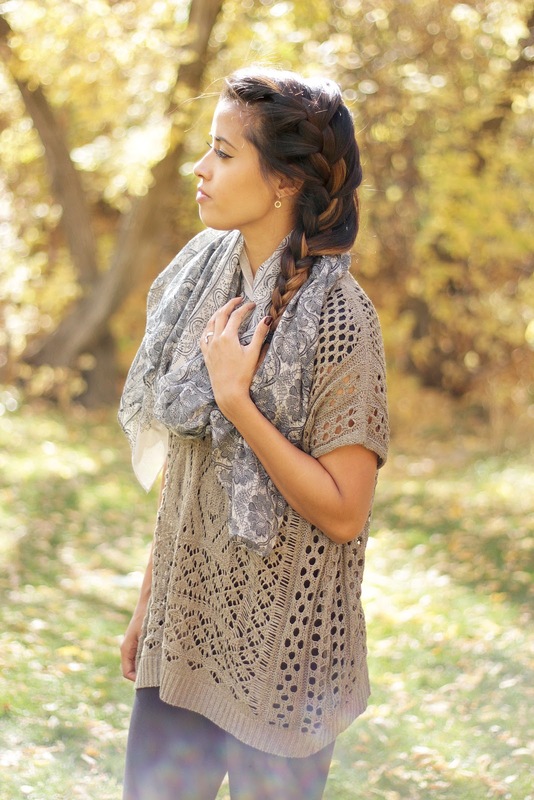 The scarf is also light and fun, which is perfect to complete the outfit. I'm so excited for Halloween tomorrow! Every year when Halloween rolls around I watch me and my mom's favorite episode of Spongebob Squarepants (yes, my mom watches SS. she's a cool mom). Gentri, this one is for youuuu!!! Love your hair!! and the scarf! I love that sweater and your gorgeous braid! Such a perfect fall look! i seriously put my hair in a braid every single day haha. i love your outfit! Lovely pics! love the rays of light peeking through. hahaha! YES! I love it, so much. Now I need to watch it. Your hair looks gorgeous long or short. And I love the outfit, of course! Very pretty, I love the background! Totally jealous that it looks so Fall there, gorgeous! You look fabulous and I am in love with your top! Happy weekend! You are so beautiful in these photos... the lighting is fantastic, too! That outfit looks so comfortable and your hair looks just perfect with it, too! I also love how you did your eyeliner! Thanks for joining TBT Fashion link up and hope to see you this Thursday.